There was no good reason for anyone to take them in. For the times were not only perilous ones, but coming from so very far away, there simply was no effective way to check them out and to know their true intentions, much less to be completely convinced that they posed no real danger to others. Indeed, the place from which they had come was a rather tumultuous land, ruled over by a fanatical tyrant whose modus operandi was usually to kill first and ask questions later. But some of the stories just didn’t seem to make much sense, at least as the strangers relayed them. So there were probably some who disagreed with the decision to offer them hospitality at all, especially given the somewhat long history of strained relations between the two countries. For reasons unknown to us, however, the people of that foreign land determined to take a chance on the rather ragged refugees who showed up on their door one day. 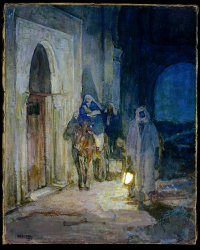 And so long ago the Holy Family–Joseph, Mary, and their newborn son, Jesus–found refuge in an Egyptian village some forty or fifty miles across the Sinai from Bethlehem. And there they remained, so the scriptures tell us, for more than a year, until the news finally reached them that the maniacal monarch, Herod the Great, who had threatened to kill their son, was dead. All of which has come to my mind in the current conversation in our country over whether or not thousands of Syrian refugees, fleeing the violence in their homeland, should find at least temporary shelter in the United States. Oh, I am clearly not privy to all of the information, though I understand the security concerns and I know that they are far from imagined and must be addressed. Likewise, if arrangements can be made to do so, it is probably indeed better to offer them a secure and safe refuge within a corner of their own country. What’s more, given the tragic events in Paris, I know that it is naive to assume that terrorists will not try to infiltrate those fleeing Syria, simply in order to get in to America and perpetrate their violence here. It is equally naive, however, to believe that slipping in among women and children is their only means of entrée to this country, for it clearly is not. At the risk of sounding too political for a pastor, thus, I believe that both Christian conscience and American values call us to find a safe and sensible way to care for even the Syrian strangers in our midst and offer refuge to all those sojourners who are in such desperate need. For indeed, how grateful I am that long ago an Egyptian village decided to extend a welcoming hand to the family of Jesus, showing hospitality “unawares” not just to angels, as the writer of Hebrews once put it, but to the very Lord Himself. This entry was posted in Uncategorized and tagged #refugeeswelcome, #syrianrefugees. Bookmark the permalink. Great post, Chap. I’m glad to see you take this position, for I feel this is a key message of the Bible. Starting with Abraham, who left a regime with which he did not agree, and Moses, whose mother put him in the river to save him from the maniacs in charge in his day, our faith is based on those who were refugees, willing to leave the evil in which they lived. It will be the reception that they get here that will mold the faith going forward, for God has always been able to bring good from evil. Naturally, some vetting is in order, but ours should be a welcoming spirit for this can change many lives for good. I am prayerful that America will open our hearts to the refugees. The political rhetoric of our conservative officials is not Christian; it is evil. For it is American Bombs that have destroyed homes of the Syrians. To provide weapons of destruction and not provide refuge to the resultant homeless families is, IMO, a horrible Sin. All of this hate, bigotry and greed that has come to define America is causing sincere pain that will take a generation to overcome. To be afraid or to encourage fear of homeless families is, IMO, cowardly. I thank Rev. Temple and Mrs. Robertson for their words and wish to take it further to state that we risk becoming an evil and cowardly nation. We can do better, both for the Lord and for America. Thanks, Chap – GREAT entry, as always!!!! Simplicity is often a good analgesic that postpones deeper ailments.